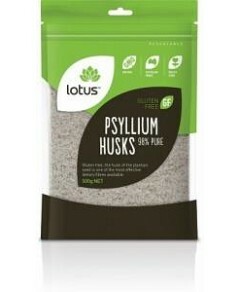 Psyllium is loaded with fibre and is an appropriate means of including more fibre into your diet. Specially made from natural fibregrain, Psyllium yields 60 to 70 percent soluble fibre, eight times more than oat bran. Taken daily, psyllium can help maintain a healthy digestive tract and also act as an effective colon cleanser - giving a plus to its standing as 'nature's internal broom'. It is simple to use, simply stir into water, juice or smoothies or add to breakfast cereals. Excellent to use as a thickener for ice cream and frozen desserts and as a binder for gluten-free baking.